In this article, we will look at the eight key points of execution for wingers on breakout plays. Before working on this, it is important to have sound fundamentals in passing the the puck, receiving the puck and the fundamentals of puck protection. Too many young teams focus on team play before learning and practising the basics. At the end of the article, click on the link for video examples of these key fundamentals. 1. Keep your head up, read the play and be committed to defensive responsibilities first, usually covering the point or the slot. Do not cheat and be at the half boards when your opponent still has the puck, this will leave your man open. 2. Once you recognize your team has gained possession of the puck, you can move to a breakout position, which for the winger is the half boards. Changing from defence to offence (or vice versa) is called transition. The goal is for teams and players to transition as quickly as possible. 3. 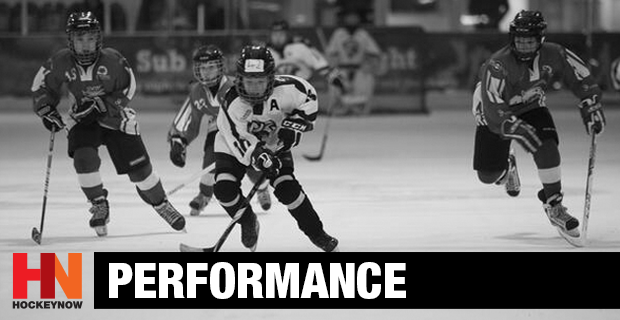 When going to the breakout position, have your body facing the middle of the ice and have your skates facing up ice. Have your “eyes up” scanning the ice, with your stick out and on the ice, and never turn your back to the play. 4. Read and anticipate your next move. Are you under any pressure, are their D pinching? How much time and space do I have? Do I have support from my teammates? Who is open? 5. Once you receive the pass, your first option is to skate the puck out of the zone. In other words, move your feet. Take two or three hard strides to create time and space. Never stand still on the half boards with the puck when breaking out of your zone. The advantage is the to the checkers. When you are skating, you can make plays and are better able to join the attack. 6. The first passing option if needed is to pass to your supporting centre. The centre must time his skating so he is supporting you “from under,” and is a few yards away from you. If the centre is “above” or ahead of you, an attempted pass can result in a turnover. A. Get your 9 iron out and chip the puck high off the glass past the pinching defencemen. B. “Freeze” or “eat the puck,” which means using your skates and body and jamming the puck on the boards keeping it away from your opponent. Your teammates can help you win the board battle or the referee will blow the whistle. C. Use the right angle to deflect the puck off your skates, the puck should move away from the boards. Use your stick to move the puck away from the boards and on to your stick. Hope these tips will help you with your transition game and get the puck out of your zone quickly. Please click below for video examples. Also, go to www.coachenio.com where you can find information on summer hockey camps and tons of free resources for coaches, players and parents. Coach Enio is a professional hockey coach of 35 years, public speaker, blogger and President of IIHSI, which operates International Hockey Camps around the world. If you have any questions about this article or would like to bring Coach Enio to your community, email at enio@coachenio.com or call +1-604-255-4747.